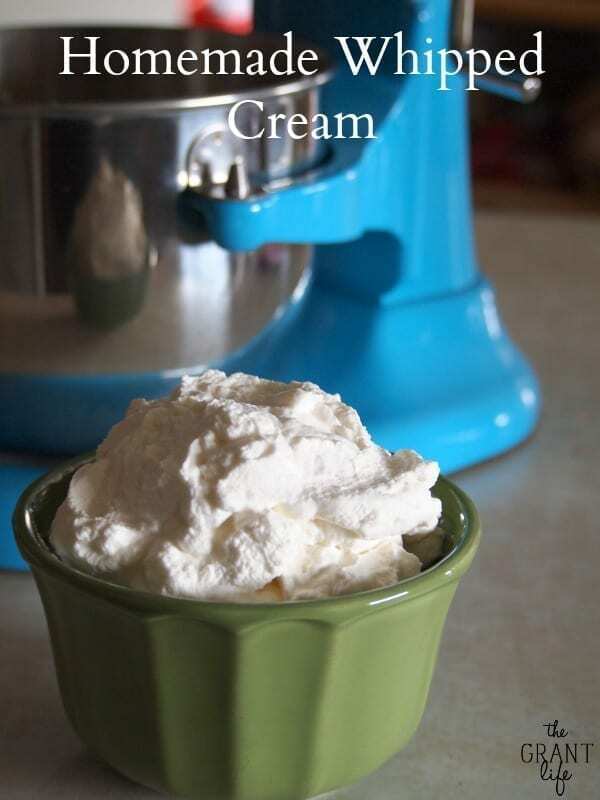 I have been saying for awhile that I need to share this easy homemade whipped cream recipe since I’ve used it in a few recipes recently. [And because its delicious.] I just needed a few photos first. I made a cake this past week and made the whipped cream so I snapped a few pictures. [Woohoo!] 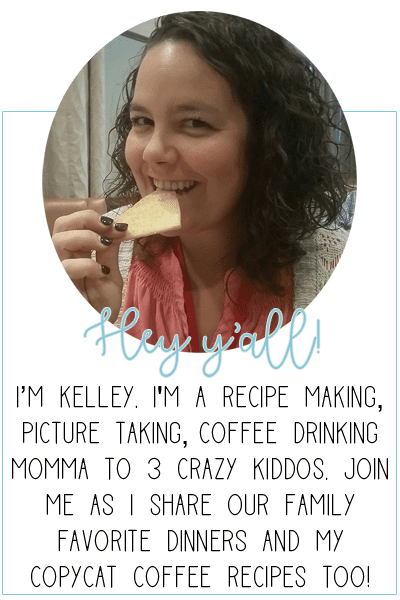 And I should put a disclaimer on this recipe – first its super, duper easy. And second its super, duper addicting. Once I started making homemade whipped cream I never looked back. Don’t you just want to swipe your finger across the top of that bowl? It’s ok if you do. After I took the picture, I did. And I may have grabbed a spoon to get a bigger bite. [Or two.] But that’s just a maybe. Say what?! Yup. That’s all you need. Now go read the back of the store bought stuff and see what it says. Its not pretty. Lots and lots of stuff that tastes good but isn’t good for you. But I digress. Now for the super, duper easy tutorial on how to make this dreamy stuff. Pour your heavy whipping cream in a chilled bowl and start mixing. Mix it for about 2-3 minutes until it starts to form soft little peaks of deliciousness. Then add your sugar and extract. Continue to mix until the whipped cream starts to stiffen up, about 1 more minute. Taste test it and then scoop it into a bowl or directly onto a cake. It should be good for at least 3 days if sealed properly. Mine never lasts that long, but it could if it needed to. Pour heavy whipping cream into a chilled bowl. 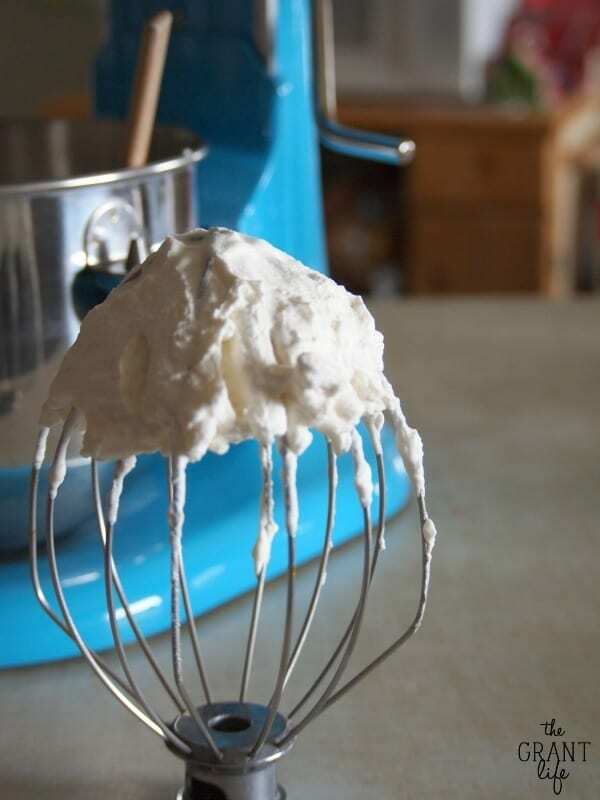 Using a stand or hand mixer, mix for 2-3 minutes until soft peak form. Mix for an additional minute until it the peaks are firmer. So there ya go. 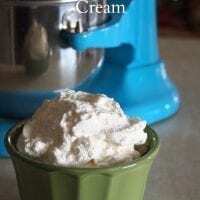 My super, duper delicious homemade whipped cream recipe. Hope yall enjoy it! Hi! Can I use raw sugar for this? I’m trying to eat clean due to health issues. Thanx! I’ve tried it with raw sugar and it works.. its just not as sweet. It doesn’t seem to blend as well with the cream. Hope that helps! Adding this to my “I am going to make this” list. Especially with your recipe for iced white mocha! Yes! You have to give this a try Jennifer.. its so so easy!